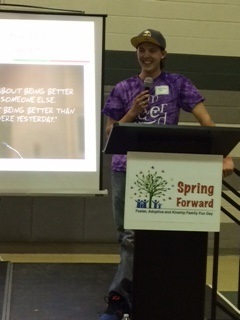 Spring Forward Family Fun Day- a great success! 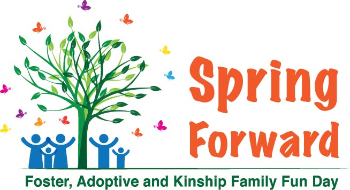 Formed Families Forward hosted our 2nd annual Spring Forward Family Fun Day for foster, adoptive and kinship families on April 11 at James Lee Community Center in Falls Church. More than 75 participants enjoyed a day of great information, fun kid activities, a self-determination workshop for teens, food and a family fun fair! 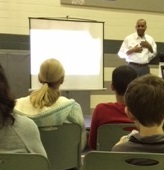 Keynote Dr. Terry Morris, NASA engineer, child advocate and former foster youth inspired us with his personal story. Dr. Morris reminded us of the value of family connections, whatever form those caring relationships take, in building and sustaining resilence. I'm Determined project youth leader Daniel Michael Lee shared his story and reflected on the value of taking charge of important decisions at school and home, through the ups and downs of teen and young adult life. Youth then participated in an I'm Determined workshop focused on building self-advocacy skills. Experienced parent and caregiver panelists offered suggestions for navigating special education in schools, and Sandra Bell from the Virginia Department of Social Services reminded all parents and caregivers to recognize the stress we all face and shared great strategies for coping (hint: chocolate was involved!). The day was made possible in part through the support of our fabulous volunteers from George Mason University who helped with child care, logistics & much more- awesome! We earnestly thank co-host FACES of Virginia Families and our many sponsors: Fairfax County Neighborhood and Community Services; the Parent Educational Advocacy and Training Center (PEATC); Moms in Motion; and Nancy Anderson and Virginia DOE's I'm Determined project. Huge thanks to all our presenters, Board members and staff who gave of their time and talents. Special shout outs to volunteer coordinator and intern from GMU Nida Liaqat and to Gaile Osborne, foster/adoptive parent advocate from FIRST parent center in Asheville, NC. ADHD & Formed Families- what's up with that? Find out May 5! May 5, 11 am- The Intersection of ADHD with Foster-Adoptive-Kinship Families: How can caregivers help? Free webinar hosted by PEATC (free). May 18, 6:30 pm- Great Expectations: Educational & Academic Pathways for Current & Former Youth in Care session. Come get the scoop on Virginia's Great Expectations program for current and former foster youth. This program supports young adults in educational and other academic paths- an amazing program for foster youth, including those adopted with special needs from foster care. Two young adults and the NVCC program advisory will share this awesome program! in Fairfax, free. Next meetings of the Stronger Together Youth & Young Adult and Parent/Caregiver groups are April 23, May 7 and 21. Q: At our most recent IEP meeting, we were handed a sheet of paper explaining something call "ESY" but school staff told us it was not appropriate for our son. We had to initial that we received the information but should we have pushed to learn more about ESY? A: Extended School Year, or ESY, services are special education services provided to some children with disabiltiies typically during the summer break. ESY services are provided only if a child’s IEP team determines on an individual basis that services are necessary for the provision of a free appropriate public education because the benefits a child with a disability gains during the regular school year will be significantly jeopardized if ESY were not provided. In other words, ESY may be appropriate if the child needs specialized instruction over the school break to support retention and learning. April is the month of the military child. Our region is home to many military families raising children with disabilities. Virginia Department of Education's recent guide and other resources help military families navigate special education and other systems. April is also Child Abuse Prevention Month. Did you know simple wellness efforts like eating well and physical activity help prevent child abuse? Spread the word about simple approaches to relieving every day stress and anxiety. 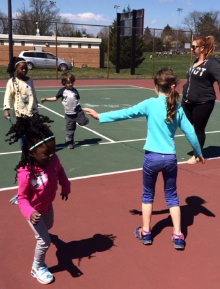 SCAN of Northern Virginia is offering a new community education program, Kids Need Connections - take a look! Our friends at the Pic Me project and the Council of Government's Kids Need a Family initiative have shared a new story of a young man in foster care. Take a look at Darren's story and SHARE! Project LIFE Statewide Youth Conference for youth in foster care, May 1-3, Chesapeake. Check out the Arc of Northern Virginia's First Fridays planning sessions, Merrifield. Really, don't we all want to be LIKED? Get formed families news first! Be sure to Like us on Facebook and follow us on Twitter.